I love this recipe! I have never been able to do a good job on the grill, but with the recipe and a pork loin, I think I can actually manage it! Even though Pop's make this pork loin on his Big Green Egg, he gives directions for just using a normal grill! Combine garlic, 3 tablespoons of brown sugar, soy sauce, sesame oil, honey, ground ginger, and 2 teaspoon black pepper. Blend in a food processor or grind to a paste with a mortar and pestle. Inject the paste into the roast using a meat injector. 20-30 injection points should give a good spread, reserve about ½ to ¾ cup. Put in plastic bag with rest of paste to marinate. Let roast sit in fridge overnight. Place the roast on a rack and place in a drip pan and place directly on the grill (you can also use a plate setter if you wish). Be sure and pu rest of liquid from bag over meat. Cook the roast for 1 hour or to at least 160 degrees. Once at temperature, remove the roast and let sit for 20 minutes. Slice the roast and serve! 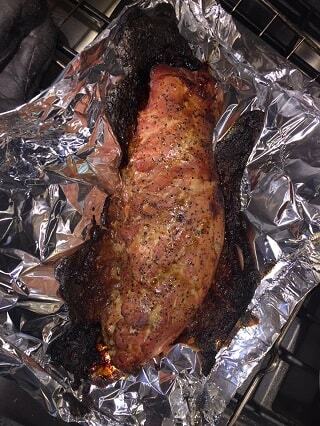 Pop's says: "Nothing better on a cold night than pork tenderloin on the Big Green Egg." I say, that's true, but, this would also be delicious at any time of the year!